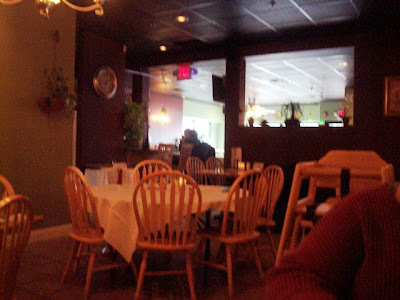 After several suggestions from our fans, and after joining the restaurant's list of friends on MySpace.com, Mom suggested that we have lunch at the Healthy Grille in Dartmouth, MA. With the Healthy Grille's fantastic concept of creating a healthier way of eating, both Mom and I felt that our bodies needed a break from all the greasy fast food that we had been filling up on as of late. We pulled into the plaza parking lot at around 3 p.m. Although this was our first time visiting, I did know that the restaurant used to be located at the end of the plaza. Perhaps the restaurant was gaining popularity and had to move to a bigger space. Either way, once Mom and I stepped inside, we both felt that the restaurant was decorated beautifully. Mom darted past the hostess station, but did so in haste and had to come back to where I was standing. We were soon greeted by a very friendly waitress, who we would later learn was named Myles. Myles grabbed two large, green menus and a specials list and asked us if we would like a table or booth. I prefer a booth, but Mom said that it didn't matter. Luckily for me, we were given a booth. Myles left the menus on the table, and then came back over to take our drink order. Both Mom and I chose to order a Diet Pepsi. When we opened the thick menu, we were both in awe at how much there was to choose from. Everything sounded amazing. After narrowing down our choices, Myles came back to take our order. 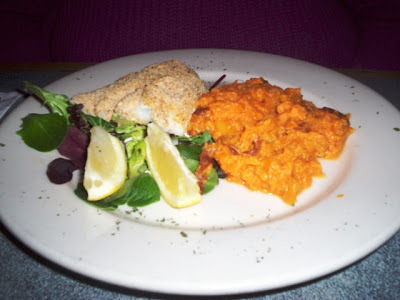 Mom went with the baked scrod ($11.99), which came with two sides. She chose the angel hair pasta and a side of mashed sweet potatoes, which were a featured item on the specials list. I went with the Greek stuffed chicken ($13.99), which also came with two sides. Like Mom, I chose the mashed sweet potatoes, and went with the Caesar salad as my second side. Myles took away the menus and left Mom and I to check out the interior. The Healthy Grille is very youthful. By youthful, I mean very trendy and modern. However, it caters to just about anyone, including children. With the walls painted both a reddish plum and a jasmine green, and the ceiling painted black, the frenzy of the outdoors seems to disappear here. Lighted sconces and floral pictures decorate the walls, while a beautiful chandelier and fan hang in the dining area. 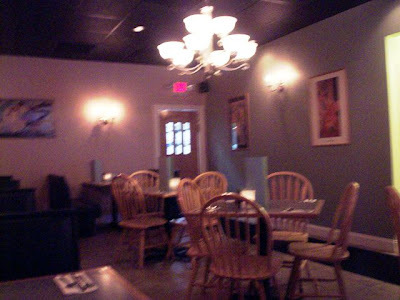 Both the booths and the tables (which were covered by white tablecloths) were topped with a decorative candle, and the printed lists of wine, beverages, and desserts. Soft rock music played in the background, faux plants were spotted throughout the dining area, and a few flat-screen TV sets were hung near the wooden bar area, which was also very trendy and hip. Even the staff uniforms - a light green shirt and black pants - were modern. *There are better photos of the dining room on their MySpace page. As I said before, there is a lot to choose from at the Healthy Grille. Appetizers include the coconut shrimp ($7.49), baked fries ($4.99), and tortilla strips ($4.59) which are served with homemade salsa. Beef, chicken, and vegetable entrees include tenderloin tips ($15.99), chicken fajitas ($10.99), turkey tips ($13.99), pork tips ($13.99), and vegetable stir fry ($10.99). Pasta entrees, where you can substitute wheat pasta for white (an additional $2), include the surf and turf served over linguine ($11.99), eggplant Parmesan ($10.99), and six cheese ravioli ($9.99). All pasta dishes include garlic bread. Seafood entrees include grilled swordfish ($13.99), sesame orange shrimp ($12.99), and pan-seared scallops ($14.99). Tofu entrees include the sweet n' sour tofu stir fry ($10.99), and the tofu fajita ($10.99). Soups include chicken rice (cup $2.59/bowl $3.59), clam chowder ($3.99/4.99), vegetable ($2.99/3.99), and tomato ($2.99/3.99), and can be served in a bread bowl for an additional $1.29. I've heard people rave about their wraps, and I can't wait to try one myself. Wraps include the honey mustard chicken ($5.99), teriyaki stir fry ($6.99), and the portabella ($5.99), which is a whole marinated portabella mushroom topped with caramelized onions, lettuce, and tomato in a balsamic vinaigrette dressing. Other foods include sandwiches, burgers, burritos, pizzas, side dishes, and desserts. One dessert that caught my eye was the Summer Snowballs ($4.99) - three scoops of vanilla ice cream covered with your choice of shaved chocolate, coconut, walnuts, toasted almond, or Heath Bar crunch. Sounds delicious! The Healthy Grille also offers a kids menus with items such as chicken strips ($4.49), linguine ($3.99), and a peanut butter and jelly sandwich with baked fries ($2.99). Wine and beer are served here, as well as specialty beverages. 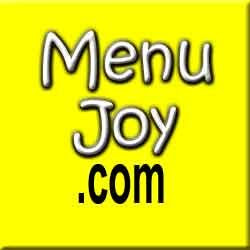 They even have coupons available on their Web site, as well as information about their catering orders. Because it was a salad, my Caesar arrived about ten minutes before my entree. The greens were crisp, the dressing was tangy, and the cheese was freshly grated. It was excellent. 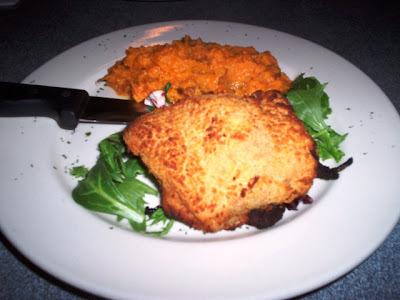 When my entree arrived, the stuffed chicken was nicely breaded, and the mashed sweet potatoes were steaming hot. Once I cut into the chicken, I found the feta, spinach, and tomatoes. They were very fresh, and went very well with the white, juicy chicken. The potatoes included the skins, which gave it an extra hearty flavor. The portion was excellent, and I was quite full after eating this delicious meal. I was so involved with eating that I neglected to take a picture of the inside of the stuffed chicken. I thought about it, but did nothing. My apologies. It was just too good! With both of her sides arriving with her entree, Mom thought everything tasted very fresh, clean, and homemade. Each dish was served piping hot, and the portions were perfect. The scrod was a translucent white with a nice crumb topping, and flaked apart very easily - she didn't even need her knife! The mashed sweet potatoes were absolutely delicious. Mom said they had a nice sweetness to them. Her angel hair pasta was very light and fresh tasting with just the right amount of sweet tomatoes on top. She loved every bit, and said the whole meal was terrific. We left $38 on the table for Myles, which included a 20% tip. She was an excellent waitress. Before leaving, both Mom and I visited the ladies room. It was decorated in the same modern style as the restaurant and was extremely clean. This dining experience couldn't have gone any better. If all goes well on our next visit, we will be bumping this up to a full fledged "excellent" score. Even their Web site is top notch! For particular dieters, all meals are marked according to the foods allowed for that plan (no carbohydrates, macrobiotic, vegan, etc.). Both Mom and I would absolutely recommend the Healthy Grille to anyone looking for a homemade, delicious meal. Whether you're on a diet, thinking about a diet, or are just looking for a change from the Taco Bells and Burger Kings, you should definitely stop by this Dartmouth gem. The freshness of the food can't be beat. You will not be disappointed. The Healthy Grille is open from 11 a.m. to 9 p.m. Tuesday through Thursday, from 11 a.m. to 10 p.m. on Friday and Saturday, and from 12-8 p.m. on Sunday. 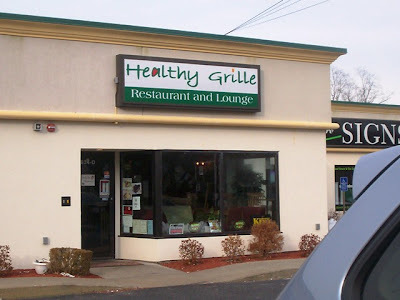 The Healthy Grille is closed on Mondays, except during holidays.